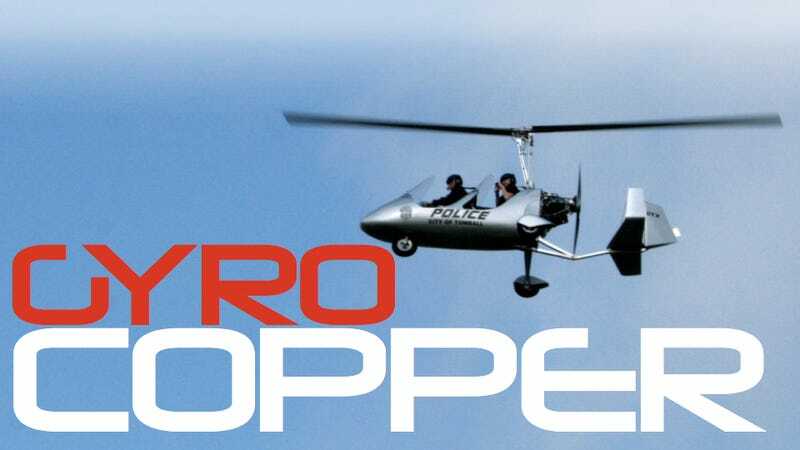 The last thing you want to hear before you climb into an aircraft with no doors and no roof is how cheap it is to operate, but it's the first thing the Police Chief tells me before strapping me into the back seat of his new crime-fighting tool: America's first police gyroplane. Conceptually, a gyroplane (or auto-gyro) is an old idea. Get the motor spinning, use a rear-mounted propeller to gain speed, and as you travel forward an angled-and-unpowered rotor above you utilizes the air pushed into the blades to create lift. "The use of this type of aircraft isn't novel. The novelty lies in the bringing of best practices from Europe to the United States" says Chief Robert S. Hauck of the Tomball Police Department, who is using a grant from the Department of Justice's Law Enforcement Aviation Technology Program to test the vehicle in his Houston suburban community. There's also novelty in using it in Tomball, Texas. As I walk around the hanger with Chief Hauck a FedEx truck pulls up and the driver's shocked when he sees the silver Auto-Gyro MTO Sport aircraft with a TPD badge on it. "I remember when we just had three squad cars," the driver tells the Chief. The MTOsport needs only about the length of a football field to take off, climbs at a rate of 13 feet per second, and can hit 115 mph. It'll also hover at a relatively low speed once airborne, allowing it to mimic a helicopter circling an area under observation. I'm strapped into the back seat of the gyroplane with the German training pilot Guido (pronounced ghee-dough) in the front seat. Just a harness and a helmet, like I was climbing into a spec Miata. We head out towards the runway and I can hear Guido asking the tower for permission to take-off. Bathed in the warm air around me I feel comfortable enough to start asking questions about how fast the rotor (only connected to the power source long enough to get it spinning) needs to spin before we take-off. I barely get the question out before we're climbing into the atmosphere. It didn't even feel like 30 feet. You're on the ground and then, suddenly, you're up in the cool air. The area around the airport is suddenly in view. If someone was fleeing the police we'd be able to find them easily. For the moment, though, I mostly just see cows and the occasional car. As we get higher Guido angles the nose up and hits the Rotax engine behind us, allowing us to sort of hover without moving forward. Guido is saying something about how the un-powered rotor makes the aircraft safer than a regular helicopter because you're already in auto-rotation. In a helicopter, the pilot has to nose the craft down and hope autorotation starts before you hit the ground. If we lost power we'd just glide down. I'm simultaneously trying to not think about crashing and enjoy the view. We've only been up for a few minutes but it feels amazing. It feels more like flying than any other small plane or helicopter I've been in before. We make another pass around the airport and then, without much preparation, Guido makes a diving charge for the ground. We're in the air and then, just as quickly as we took off, we're on the runway. I've gone much faster in car, but the lack of doors and roof and any sort of reference point for where you are other than the ground makes the speed of the TPD gyroplane feel like a roller coaster with no tracks. A modern, loaded police helicopter can cost anywhere from $1.5 million on the cheap end to $4.0 million at the top. Operating costs are also high, averaging around $1,000 per hour with a two-pilot crew. The Auto-Gyro MTOsport loaded up with radios and painted costs about $75K and is only $50 an hour to operate, due in part to the fact that it flies on regular pump gas. That's roughly the cost of buying and operating two top-of-the-line squad cars. Compared to a helicopter the gyroplane has its limits. It's best flown during the daylight hours, it doesn't carry thermal imaging FLIR cameras or large light beams. There are no roofs or doors so it's not going to be a fun ride in bad weather. Tomball can't justify the cost of a helicopter program, but when they need air assets they have to go to the City of Houston or Harris County. In emergency situations this can mean waiting up to an hour for assistance, if assistance comes at all. Harris County has over 4.1 million residents, including 1.6 million in unincorporated areas like those surrounding Tomball. If officers are on standby the MTOsport can get in the air and serve this area in about 10 minutes, including pre-flight check. "By putting a trained pilot and a trained tactical flight officer in this aircraft up over the city of Tomball and the surrounding area we're able to essentially deploy the equivalent of 20 police officers and I can't do that do that every day, I can't deploy 20 police officers," said Haulk. This is just a pilot program with the goal of getting 300 hours of service to determine the benefits, real costs, and best practices of using such a plane to augment existing police forces in areas with a need for such assets. Chief Haulk's betting it's a good value, but at this price he's not exactly betting the house.